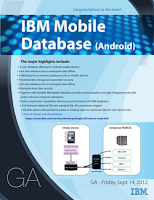 Today IBM Mobile Database – the new database offering for Android mobile devices – went GA. IBM Mobile Database offers a tight integration between a customer’s mobile solution and their existing DB2 or Informix environment. It is being offered as a free-of-charge web download. The new offering makes it easier for mobile developers to develop and assemble applications for Android devices. Together with the solidDB offering, IBM Mobile Database provides the capability to synchronize data with DB2 and Informix databases. What Android mobile app would you build to put these features to good use? Marius, IBM Mobile DB is great but only for companies that rely on IBM infrastructure. And what about situation that company is using other DB or want to develop solution for iOS or Windows Phone? You can have a look at our solution - mobeelizer.com and I'd be more than happy to see your opinion about it. I think the kicker here is the offline access bit. It has to be paramount that a reliable point of access can be maintained; otherwise the whole thing will be pointless to consider for use. Together with the solidDB offering, IBM Mobile Database provides the capability to synchronize data with DB2 and Informix databases.